10 spline on a 1 3/4 inch hub diameter. 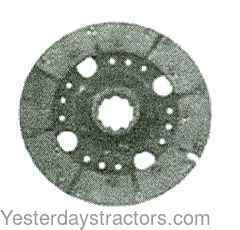 PTO Clutch Disc For 20, 30, 40, F40, MF135, MF150, MF165, MF175, MF180, MF35, MF50, MF65, TO35. New, aftermarket Clutch Disc, 9 Inch for sale with a solid manufacturer warranty. In addition, we have a generous 30-day return policy if this Massey Ferguson Clutch Disc, 9 Inch for Ferguson 20, 30, 40, F40, 135, 150, 165, 175, 180, 35, 50, 65, TO35 tractors needs to be returned for any reason. Please see our Parts Warranty and Return Policy links on your left for complete details before returning. Most Massey Ferguson transmission problems can be traced to parts that the average person can change by following instructions provided in the service manual for your tractor. If there is a funny smell coupled with limited acceleration, most likely your clutch is slipping. Try and adjust the clutch to see if this is all that is needed. If it doesn't help, or the smell is accompanied by a scratching noise, you need to replace the Massey Ferguson tractor clutch disc, pressure plate and throw out bearing.